This homemade hair-pack conditions as well as imparts shine and bounce to lifeless, dull hair. Start using this pack twice a week for a month before your wedding. 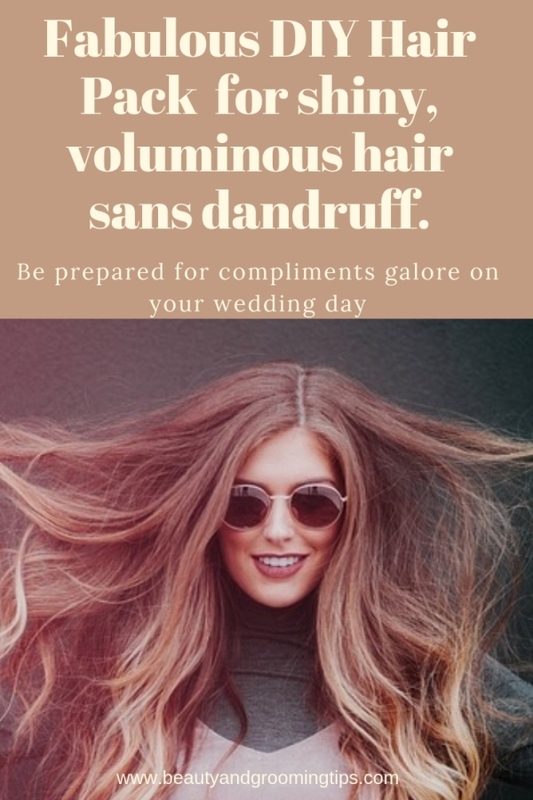 Soon you will have shiny, breathing, voluminous hair sans dandruff. Be prepared to expect compliments galore on your D-day. Mix all the ingredients and apply it on your hair. Leave for 25 minutes and then shampoo. Apple juice contains malic acid which helps slough off dead skin cells from the scalp and as such helps with dandruff. Additionally it has biotin which helps promote hair growth. Honey nourishes and moisturizes hair and is antibacterial as well and therefore is great for dandruff. And contrary to popular belief, application of honey on hair does not cause premature graying. Fenugreek seeds (methi) are high in protein content and nicotinic acid and can help with hair fall and dandruff and lots of other scalp issues. Usage of fenugreek powder in a hair pack can not only moisturize and condition the hair but also remove oiliness from the scalp. They bring the luster and bounce in your tresses. Yogurt also is very nourishing and cleansing for your hair; it has lactic acid which helps clear dead skin cells from the scalp and helps hair follicles grow. So do try this DIY hair mask which has the most mundane ingredients form your kitchen pantry and do let us know how it goes for you. These are indeed some of the amazing Ingredients: for shiny hair I have ever come across. Excellent Aparna. To give your hair some extra shine, try mixing the juice of 1 lemon with 2 cups of water and then use it as a natural hair rinse after you shampoo. Leave it on for 5 minutes and then rinse with clean water.